Born in 1934 in Philadelphia, Shirley Scott was raised listening to jazz music, since her father was the owner of a jazz club in which such artists as Red Garland an Philly Joe Jones used to perform. Her brother was a saxophone player and used to practice his instrument in the jazz club, and since he needed somebody to play piano with him taught young Shirley the first "right" chords. Shirley got used to play with saxophone players, infact not only she played for ten years with Stanley Turrentine (who also became her husband), but also performed and recorded with Eddie "Lockjaw" Davis, Coleman Hawkins, Buddy Tate, Charlie Rouse, Arnett Cobb, John Coltrane and George Coleman. Since then, after some "pop" records for Atlantic in which she played some hits of the 60's with such musicians as King Curtis, Bernard "Pretty" Purdie and Hank Crawford, she performs in clubs and festivals all over the world switching from piano to organ, always playing with her typical grace and big knowledge of jazz idiom, from swing to bebop. The MP3 files you can download are from the beginning of the 60's. The first MP3 is the slow blues "Chopped Chops", from "Workin'" (Prestige PRCD - 24126-2), recorded in 1960 with Ronnell Bright - piano, Wally Richardson - guitar, Peck Morrison - bass, Roy Haynes - drums. The second one, "Secret Love", is from "Soul Shoutin'" (Prestige PRCD 42142-2), and it was recorded in 1963 with Stanley Turrentine - sax, Major Holley - bass, Grassella Oliphant - drums. 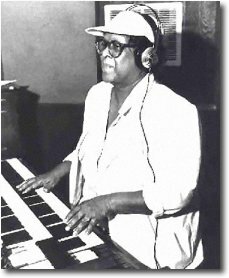 The sound she uses was also very often heard from Ray Charles, and it's probably one of the ten original Hammond factory presets obtained pressing one of the ten keys with reversed colors (from C to A) on the left of each manual. This is a preset you should use playing on the lower octaves of the manual: it would sound too treblish if you play in the upper octaves because the two first drawbars are missing. The leslie has been stopped and the vibrato is off. 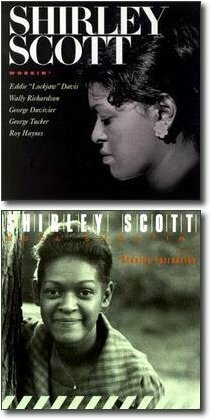 In the second MP3 we can have a taste of the typical Shirley Scott way of soloing... Soft and delicate in phrasing, never obvious and always rich of swing and bebop echoes. The preset should be the same as before. The only difference is the Leslie, which is set on "fast". In the second part of her solo she changes preset, probably using another one of the factory presets, close to a "full organ" sound like the ones frequently used by "Wild" Bill Davis and Milt Buckner, Shirley's source of inspiration.